I took this random ministry pic at Emmanuel Bible Camp in Prince Edward Island when we were there in August of last year. That feels wierd saying last year, but I guess it was the summer of 2005. A group of about 150 christians, including Hayley, myself, Veronica, Lukas, Sylas & Olivia gathered at camp, which served as "home base" for our mission...an amazing feat for Jesus...distributing 50,000 Seed Sowers packages, effectively getting HIS words out to cover the entire province...like the dew! 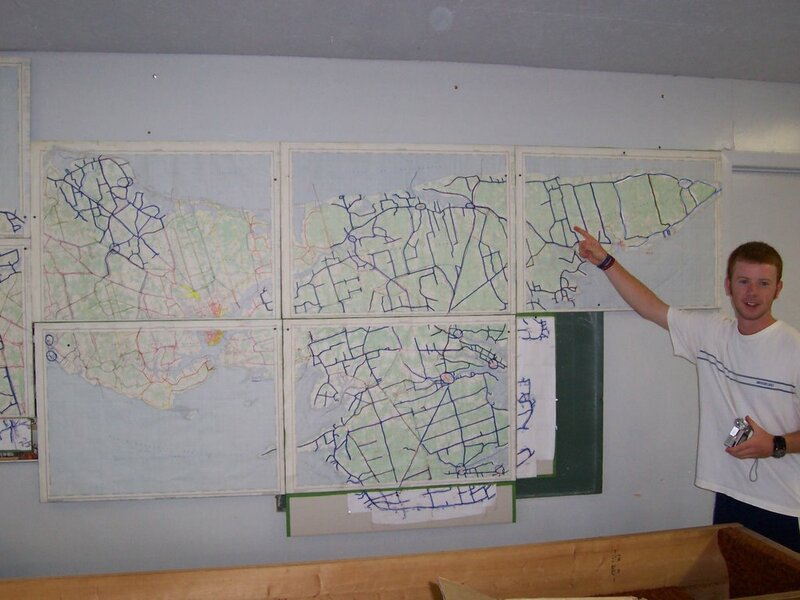 Our assistant in the picture, Matt Cote, is showing us the map that was on the wall at the camp. 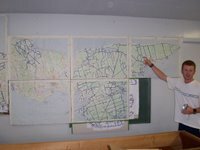 The map shows Prince Edward Island and each town and village as it was completed. Props to Bob Magregor for the hours he spent working on the logistics and photocopying maps of PEI for each team. Matt is pointing to where the camp is located. It was quite the journey of faith for us, trudging mile after mile from mailbox to mailbox. Special thanks also to the assemblies in PEI who helped in so many ways, as well as Don Cox from Quebec for organizing the outreach. Please continue to pray for the people who received these texts, and for the churches in PEI to continue to reach out! May Jesus get the glory! If anyone from PEI has updates on the follow up, please post them here.